You've got one of them in your life: a person who likes their fiction with pictures. Sometimes with capes, too. Get some ideas about how to make their holidays super right here. An avid comics reader can be a tricky person to figure out a gift for. But we've got a few suggestions below that should make a loved one's longbox or bookshelf a much happier place. DO consider gifting a tablet for reading comics digitally. Whether it's for space-saving consideration or convenience, loads of comics readers nowadays are using touchscreen devices to read their favorite medium. Depending on your budget, a Kindle Fire HD, iPad Air or Google Nexus 10 would certainly be a welcome present. DO hook them up with a Comixology gift card. Most of the major mainstream comics publishers have their catalogs available through Comixology, the biggest comics digital distributor around. 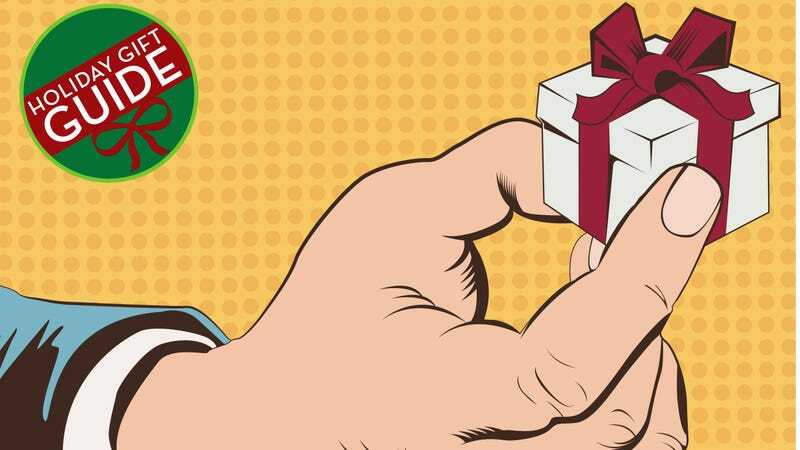 Chances are, you comics fan will spend a chunk of gift cash in no time flat. DO consider Paul Pope's excellent Battling Boy for both younger and veteran readers looking for something fresh, fun and incredibly rendered. DO get the boxed set of Boxers & Saints by Gene Ha for the history buff in your life. Even if they don't make a regular diet of word balloons, they should still be moved by this powerful story set in one of China's bloodiest conflicts. DO acquaint your superhero fan with the current run of Batgirl. The Dark Knight's corner of the DC Universe is full of well-done series but the one starring Barbara Gordon is an unsung gem. It gets way dark and quite violent but the main character remains a symbol of ingenuity, hope and perseverance throughout. DO hit the bullseye with Hawkeye, Vol. 2: Little Hits. If the comics reader in your life is over the constant cosmic crossover stunts in superhero comics, the fun, moody character-driven stories in this collection should suit them fine. Fine work by co-creators Matt Fraction, Francesco Francavilla, David Aja, Jesse Alan Hamm, Steve Lieber and Annie Wu. DO explore one of the best series running today by diving into Saga. If your comics-savvy loved one is smart, they're already reading Brian K. Vaughan and Fiona Staples' excellent serial about the starcrossed couple from warring races who become parents during wartime. If they're not reading Saga, making it a gift to them will automatically make you the best present-giver of the year. DO make a rap fan delighted and slide a copy of Hip Hop Family Tree into their hands. Ed Piskor's intensely researched webcomic about the early days of rap music gets a stellar collection from Fantagraphics, with great art and a fun packaging treatment that feels like it arrived from a 1981 time capsule. DO track down a copy of Sean Howe's Marvel Comics: The Untold Story. This book is a hilarious and informative biography of the place where Spider-Man, the Hulk and Iron Man were all created, full of facts and stories that some Marvel lovers may not even know. DO go up, up and away and come back with Superman: The Unauthorized Biography. Glen Weldon's survey of the Man of Steel's publishing history details the ways and reasons that Superman has changed over his 75-year existence. Required reading for any Last Son of Krypton fan. DO get them a hotel room or tickets for a local comics convention way in advance, if possible. Comic-cons are the rare chance to meet the talent behind the characters and series that people love, often bringing opportunities for autographs, pictures and anecdotes. So it's a gift that can make their collection even more meaningful. DO build some happiness into a fan's life with Lego Marvel Super Heroes. The always great Lego video games finally plant a flag in the Marvel Universe, with a giant world to explore and a huge cast of heroes and villains battling it out to save the world. DON'T pick up Scribblenauts Unleashed: A DC Comics Adventure. While it's an incredibly thorough catalog of the publisher's superhero universe, this word-centric title just isn't a very fun game experience. Feel free to drop your own suggestions below.